The Law Library recently mounted a display on Hugo Grotius (1583-1645), widely known as “the father of international law.” Grotius was not as well known for his anti-Calvinist writings, but those inflammatory writings resulted in his being tried, convicted and subsequently imprisoned for the act of treason in 1619. The library display, the first in a series of displays in which we will provide little-known information about famous legal figures, featured the very rare, original trial court sentencing document, The sentence of eternal imprisonment pronounced against Hugo Grotius in the extraordinary trial for laesa maiestas, Rotterdam, May 18, 1619. After twenty months, Grotius escaped prison by being spirited away in a book trunk. 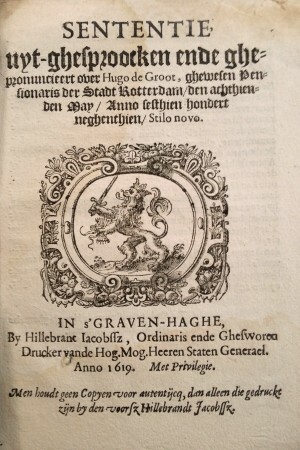 The Law Library’s Grotius collection is one of the largest and most comprehensive in the country. For more information, see an overview of our Special Collections and an earlier article by Herb Somers, Foreign/International Law Librarian, “The ‘Father of International Law’ is Well-Represented at The Jacob Burns Law Library, A Legal Miscellanea, Vol. 1, Number 2 (Autumn 2004).